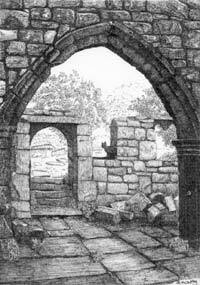 Code no CT183: Drawing of the old church, Heptonstall, by Stan McCarthy. A poem unearthed by local artist Stan McCarthy provides a gruesome sequel to the story of a murder featured in our last issue. The bloody events of 1432, when the priest at Heptonstall old church was stabbed to death at his altar by "the dark-browed Earl of Warren," are told in full in the poem, published anonymously in 1900. The poem runs to 49 verses and also features in "Heptonstall: A Walk Around the Edges" (available from Heptonstall Post Office price £2). Read the full story in "Milltown Memories!"